Well this year I have definitely earned an F in blogging. 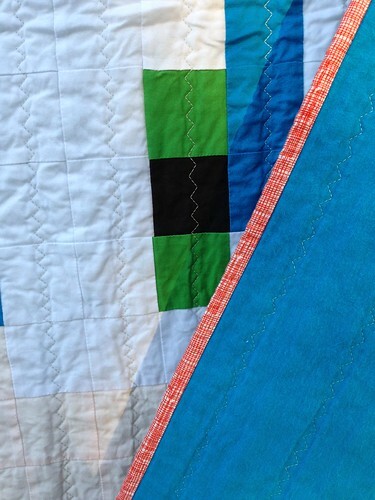 But a lot of these quilts have been gifts so now is the time I have to blog and post pictures of them. 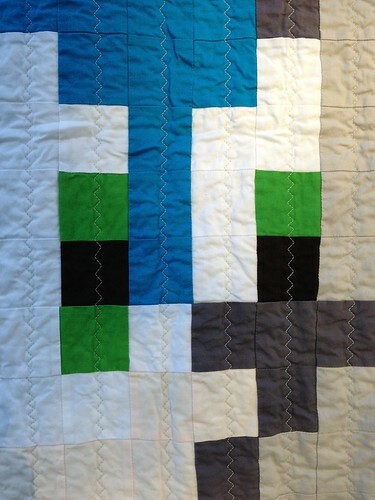 Over the next week I will have a new post each day showing the final 8 quilts I finished this year. 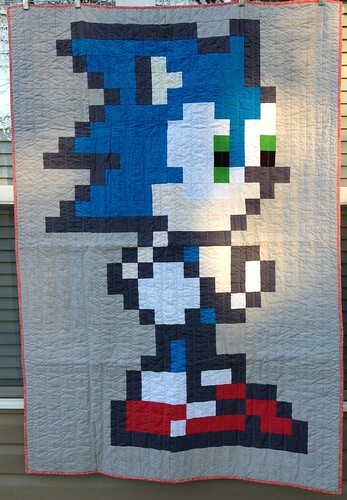 Starting off with the Sonic the Hedgehog Quilt! This was nephew quilt number 3 of the year. This one was finished in November just in time for his birthday. I managed to sneak this finish in between football games this year and deliver it to NWA. This quilt was entirely pixelated with over 150 squares to make up the image. I zigzag stitched down each column to not take away from the overall look. It was backed in his favorite color, blue flannel, and bound in red cross-hatch fabric. It was well received and Derek of course was smitten with the pixelated look.